That statement ends Elaine and Orrie Greenwood’s article “Greyhounds Go Volksmarching” (CG Magazine, Spring 2001). The Greenwoods are committed to volksmarching; they participate in one whenever they can find one — and for good reason: they are a glorious way to spend a day with one’s greyhounds and with each other. The article has inspired many greyhound folks to do the same. What is the difference between volksmarching and walking? Organization. According to Elaine Greenwood, volksmarching, also known as volkswalking and affectionately referred to as hundmarching by greyhound-owning fans of the sport, is one of a group of sports called volkssports. The other sports are volkssbike (biking), volksski (cross-country skiing), and volksswim (swimming). All are organized events designed to appeal to people of all ages, unlike the average walk that is not organized or regularly scheduled. The difference is in the organization, regular schedules, planned routes, and in the case of volksmarches, walking club sponsorship. Literally translated from German, volks means people; therefore, volkssports means sports of the people. The volkssports concept originated in Europe in 1968 as the Internationaler Volkssport Verband (IVV). The IVV’s main purpose is to promote a healthy lifestyle through planned activity. In the United States, the American Volkssports Association (AVA), formed in 1979, promotes the IVV’s concepts. Both groups plan walks that may be done as a group or as a private individual; they may be done to achieve personal goals or done for the pure fun and relaxation of it. The Greenwood’s personal goal is to do a volksmarch in all 50 states. The Greenwoods have been volkmarching for about 16 years, most of them with their greyhounds, Maddie and Neeko, and with their late cocker spaniel, Misty. Their veterinarian told them that volksmarching contributed to Misty’s long life (which stretched into her mid teens) by strengthening her respiratory and circulatory systems and toning her muscles while maintaining flexible joints. Volksmarching is a low stress activity resulting in enormous benefits to body and soul (human and canine), regardless of degrees of physical prowess. The out-of-shape get in shape and the in shape become even stronger and healthier. Everyone wins. During a volksmarch in Allentown, Pennsylvania, the Greenwoods happened to meet Maggie Spilner, executive editor of the Prevention Walking Club Newsletter and a senior editor of Prevention Magazine, while Maggie was manning a checkpoint. Maggie, enchanted by the idea of combining the dual passions of volksmarching and greyhounds and all that surrounds them, decided to feature the Greenwoods and their greyhounds in the September/October 2000 issue of the Prevention Walking Club Newsletter. The article gave a major plug promoting greyhound adoption as well. Enter Kathleen Gilley of the Dancing Greyhounds. When Kathleen heard about the article, she smelled an article for Celebrating Greyhounds as well. She contacted Marcia Herman, the CG editor at the time, who said to Kathleen, “Great story idea…go for it!” One thing led to another and when all was said and done, not only did Kathleen convince the Greenwoods to write an article for CG Magazine but also to hold a two day Greyhound volksmarch that the Gilleys and the Hermans would be able to attend. By early 2001 the event was already taking shape; the York White Rose Wanderers Volksmarch Club and Personalized Greyhounds, Inc. became co-sponsors. Personalized Greyhounds, Inc. agreed to include information about the walk on their website and put an article in their April/May and July newsletters. The club supplied Personalized Greyhounds with brochures of the event to include in their newsletters and distribute at their annual picnic. Their table had information about adopting a greyhound, and sold baked goods and greyhound items. The group assembled volunteers to man the table for both days. The York White Rose Wanderers Volksmarch Club also included information about the walk on their website and put an article in their newsletters. They set up two tables at the start/finish point because the club needs to account for each walker out on the trail. Volunteers at the starting table registered the walkers who carried a card and signed a disclaimer; volunteers at the finish table collected each walker’s start card. This club decided to sell food items, such as barbecue, hot dogs, drinks, desserts, and the like. In addition to the food, they sold items that pertained to volksmarching, including the patch for the event. They provided club volunteers for both days to man their tables, the food concession stands, the checkpoints, and floaters who checked on walkers out on the trail. All the preparation paid off. September 22 and 23, 2001 dawned bright and summery in York, Pennsylvania. The volunteers were ready! 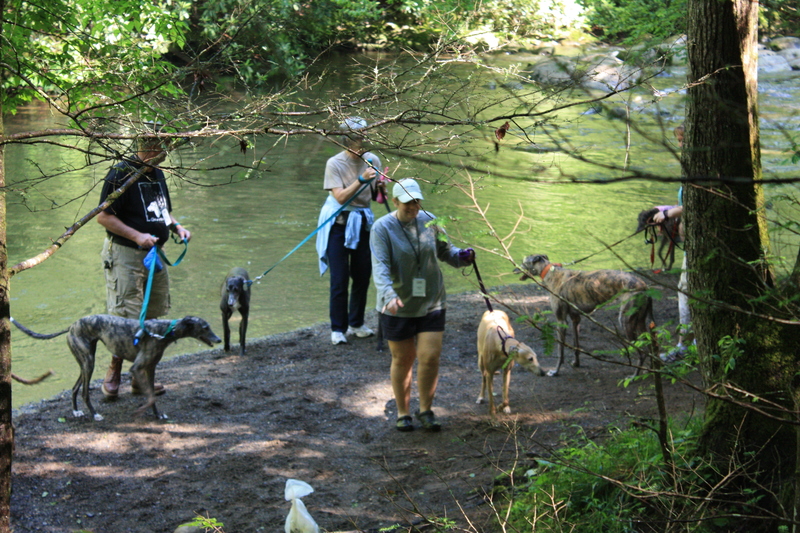 The event and the good weather attracted more than 400 people and 100-plus greyhounds to the scenic Spring Valley County Park. Many local people participated in the event as well as people who traveled hundreds of miles. The event was a smashing success on many levels — as a volksmarch, as a greyhound event, as a public awareness event, a social event, and even as a day of walking in a lovely setting. “Last September’s volksmarch co-sponsored by The White Rose Wanderers of York, Pennsylvania and Personalized Greyhounds, Inc., was yet another example of how well Greyhounds fit right into the numerous and varied activities of people’s daily lives. Many of the volksmarch regulars who participate in these events and come from distant locations to do so told us that they had not seen so many greyhounds together at one time and how well-behaved and beautiful they were. Of course, we knew that already — and so do the greyhounds know how beautiful they are; just ask one! For more information on walking clubs and volksmarch schedules, please visit the AVA website at http://www.ava.org.